After having a fun time with the original Gingerdead Man, I was more than excited to check out the sequel. 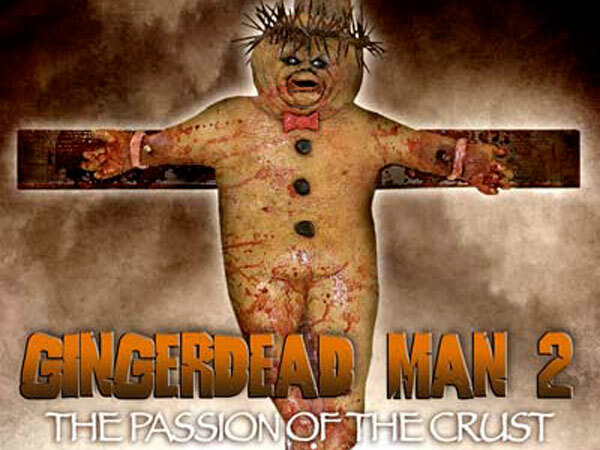 The name alone hooked me right in-Gingerdead Man 2: Passion Of The Crust. This flick was distributed by Full Moon Entertainment, it’s got a perfect running time of 82 minutes and features the killer gingerbread man; what could go wrong??? The young owner of Cheatum Studios is doing what he can to save the business, but the blood-thirsty cookie has different ideas as he brings terror to the low budget productions. With fun and cheesy deaths and effects that one would expect, it is easy to have some fun with this film. The downside, at least on my part, was the comedy aspect of this horror-comedy. I just felt like I wanted to laugh way more than I did. Maybe this is more of a movie to watch with friends while playing some kind of drinking game. That seemed to work great with Birdemic! Or maybe it just needed Gary Busey to return? All in all, I found many pros and cons with Gingerdead Man 2: Passion Of The Crust, but this film sure can be part of a fun night if paired with the other parts of the series. So, go out and rent/buy the dvds and call it a Gingerdead Man marathon night!